(TibetanReview.net, Mar23’19) – Counties in Tibet Autonomous Region have launched a new political education drive in monasteries, described euphemistically as a lecture tour to promote legal and policy awareness among monks and nuns and safeguard national unity. Gonggar County in Shannan (Tibetan: Lhokha) Prefecture has already started its 2019 education campaign and plans to make the campaign a regular activity, reported China’s official globaltimes.cn Mar 21. The campaign uses indoctrinated monks and nuns as lecturers in the belief that they will command peer credibility. The report said that starting Mar 5, such lecturers, as well as other lecturers, informed monks and nuns in the county on how to firmly uphold the leadership of the Communist Party of China and unswervingly follow the road of socialism with Chinese characteristics. They also spoke on how to safeguard national unity and strengthen ethnic unity, the report added, citing Tibet Daily Mar 21. 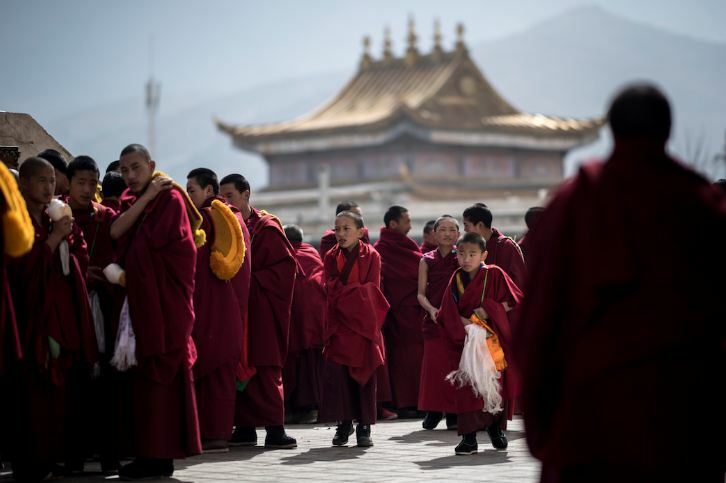 The campaign requires that monks and nuns be politically reliable and take a clear-cut and firm stance, be profound in religious knowledge, be convincing in morality and play an active role at critical moments, the report said, citing a special workshop held in 2018 and reported by Tibet.cn. Citing the regional government’s website, the report said Cona (Tsona) County in Shannan had launched a similar campaign on Mar 11, incorporating education on the Constitution and other laws to raise monks’ legal awareness and understanding of national policies.